Dopo essersi risvegliato dal coma, un uomo parla una lingua irriconoscibile per i linguisti d tutto il mondo. Riuscirà a farsi capire? A man wakes from a coma speaking an unrecognizable language to linguistic experts from around the globe. Will he be able to communicate? Benjamin Cleary è un cineasta irlandese vincitore del Premio Oscar per il Miglior Cortometraggio Live Action nel 2016 con Stutterer. Il film è stato premiato anche a Cannes con il Young Director Award, ha vinto l’Irish Film & Television Award e il London Critic’s Circle Award. TJ O’Grady Peyton è un regista irlandese laureato alla London Film School. Ha girato spot per BMW, Gatorade, Cadillac, Nespresso e Conde Nast. Sarà al fianco di Ellen Page in The Third Wave. 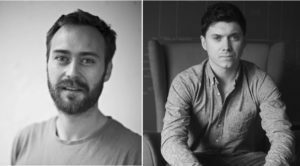 Benjamin Cleary is an Irish filmmaker, winner of the Oscar for Best Live Action Short in 2016 with Stutterer. His short also won Cannes' Young Director Award, an Irish Film & Television Award (IFTA) and a London Critic’s Circle Award. TJ O’Grady Peyton is an Irish director who graduated from the London Film School. He has created commercials for BMW, Gatorade, Cadillac, Nespresso, and Conde Nast. He will be acting alongside Ellen Page in The Third Wave.